Famous favourites in the air and on the ground will blow your mind, whilst the attractions and Zones in the Arena will keep you entertained and buzzing with delight the WHOLE weekend. Eyes to the sky as the 'Wings' of the event treats visitors to outstanding and diverse 5 hour air displays which have previously included show favourites the Red Arrows, Eurofighter Typhoon, Battle of Britain Memorial Flight, Apache Air Assault display the Tigers Parachute Team, the Blades, Strikemaster, Hangar 11 Hurricane, Richard Goodwin and Sally B, accompanied by witty and knowledgeable commentary from aviation experts and display pilots. 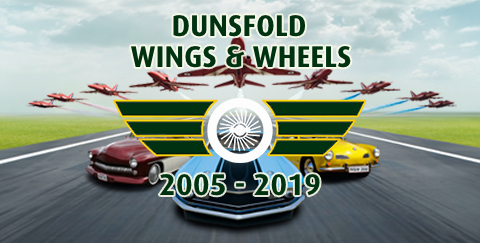 The 'Wings' of the event would not be complete without a close-up inspection of all the weekend's visiting aircraft including Dunsfold's resident Boeing 747 in the 'Wings Park' (open for tours) and Aces High DC3. Supercars and classic and vintage icons put on an awe-inspiring display of power and speed on the Top Gear track in a 2 hour auto spectacular. The 'Wheels' of the show includes displays from McLaren 12C, Lamborghini Aventador Roadster and Huracan, Pagani Zonda, Ferrari California T, Aston Martin Rapide, Dodge Monaco, TVR Tasmin 280i, Ducati Multistrada 1200s, Ferrari F355 Berlinetta, Ford GT40 and Lotus Elise. Visit the Wheels Zone with a bigger and better crowd line parade and interactive displays from car and motorbike clubs. Visiting this year's Wheels Zone is the Monster Truck arena offering demonstrations and passenger rides. The Military Zone & Parade is interactive and explosive bringing re-enactors, a living history zone and our popular military vehicle parade. The Zone has over 80 military vehicles, six re-enactment groups, as well as the history of Dunsfold Aerodrome and Army, Navy and RAF recruitment stands for everyone's enjoyment. Sid's Zone is an action packed free area for the little ones. From 10:00 until 16:00 the kids can join in with colouring competitions, arts and crafts, face painting and the popular Sid's Trail which encourages the whole family to search the arena for questions and answers to win a goody bag. Meet and greets with show mascot Siddeley and the display pilots are not to be missed. The excitement and anticipation doesn't stop at the main displays as the 32 acre public arena is bursting with a huge variety of interactive attractions containing all you need for a great family day out. The show arena boasts go-karts, kit-plane demonstrations, military outlets and displays, static aircraft, fairground and over 80 retail outlets selling a wide variety of products and gifts. Taking the hassle out of your day the show includes added extras to make your experience even more enjoyable; over 18 catering outlets, two bars, hospitality facilities, free on-site parking, public camping, lost children point, disabled access, informative show commentary, opportunities to meet the pilots, official show merchandise and grandstand seating.